The Apollo 58000-650 is a UL Analogue Addressable Photo-Electric Smoke Detector which uses the XP95 protocol. This sensor is ideal for detecting slow burning or smouldering fires. 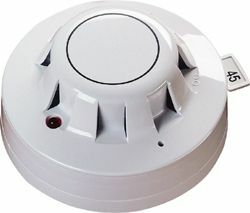 For more information on the Apollo 58000-650 APO Smoke Detector call us NOW on 01200 428 410. Apollo are one of the worlds largest manufacturers of smoke and heat sensors. They manufacture products for markets all around the world. The Apollo 58000-650 Detector uses the Apollo XP95 range of sensor bases. These bases feature an integral Xpert card which is used to give each device a unique address number on the loop it is being installed onto. This number is used by the control panel to assign a text address against. This then allows the occupants of a building to locate a device which may have detected a fire or given a fault message. The 58000-650APO device is part of Apollo’s UL range of analogue addressable sensors. These devices are ideal for use on UL listed fire alarm control panels which are compatible with the Apollo XP95 analogue addressable protocol. If you’re interested in this product you may also be interested in our Apollo Discovery Detectors and Apollo Discovery Call Points ranges.